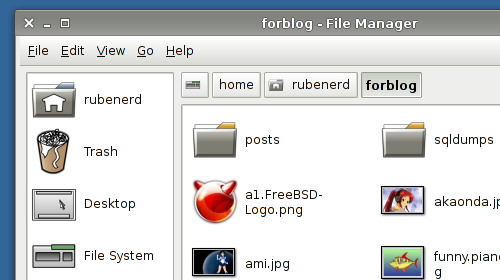 This post is part of a series on Xfce, originally posted on my university blog. I’m republishing them here in the hopes that others might find them useful or interesting. Cheers! In part one of my Fun with Xfce series I talked about why I like using Xfce to begin with, and in part two I explained how to install the complete desktop environment from scratch using FreeBSD ports and pkgsrc, as well as some free GNU/Linux distros that use it by default. In this post I'll be showing you how I spruce up Xfce to look much more spiffy, learned from many hours of experimentation! When you run Xfce for the first time, it does look a bit bare. I revel in this; it's like getting a blank but very flexible canvas to change as I see fit! Assuming you installed the complete desktop using a "meta" package or port, the first thing you can do is browse the built in themes and options. Right click your desktop or click the Xfce icon in the lower dock to bring up the Desktop Menu, then navigate to Settings and click Settings Manager. The control panels you'd be interested in are Desktop, User Interface and Window Manager. They're extremely well laid out and very self explanatory. 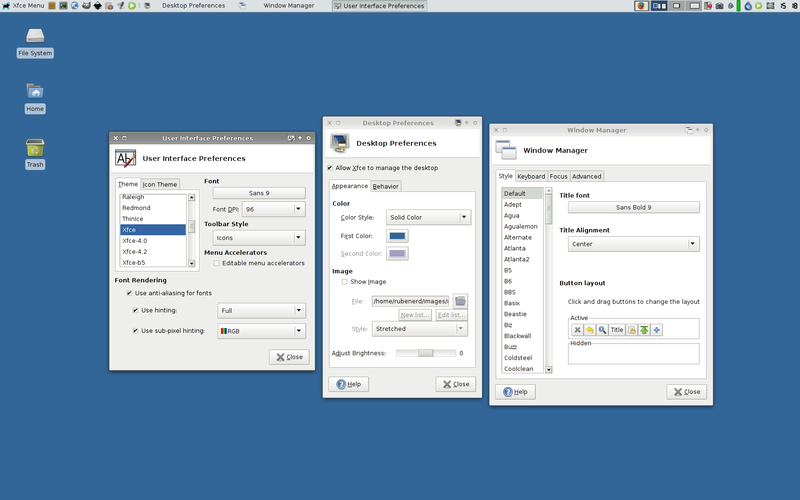 If every computer system had configuration panels that were as intuitive as Xfce’s, I imagine the world would be in a much less stressed place! While Xfce does come with a beautiful collection of polished window manager decorations (aka title bar styles), personally I don't like the built in themes as much and am not a big fan of the lone icon set. 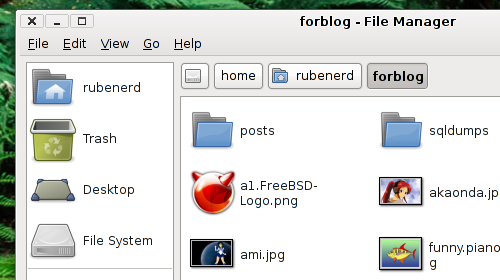 Fortunately because Xfce uses GTK+ you can use many of the same themes and icon sets developed for the much larger GNOME desktop with no problems. Kick arse! First to the themes: personally I like using the Clearlooks theme engine that is used by Ubuntu. It looks very polished and doesn't have as much of a chiseled look as some of the default themes. In the FreeBSD ports system there are two different versions available which caught me out the first time! Once you've installed them, go back to your User Interface settings screen and choose Clearlooks from the list box. As for icons, I'm a huge fan of Tango Desktop Project who's stated aim is to "help create a consistent graphical user interface experience for free and Open Source software". The icons they've developed look very swish, scale beautifully and use lots of green and blue which I prefer to the default Xfce brown iconset. Just by installing Clearlooks and the Tango iconset, you'll be rewarded with a much prettier desktop! Before and after shots below. Okay I cheated in that second shot, I set a desktop background and changed the window decoration to Katiola which blends the menu and title bar to make it look more OS X-ish.